Hello everyone! My name is Chrissy Lux and I co-own Sew Lux Fabric with my mom. 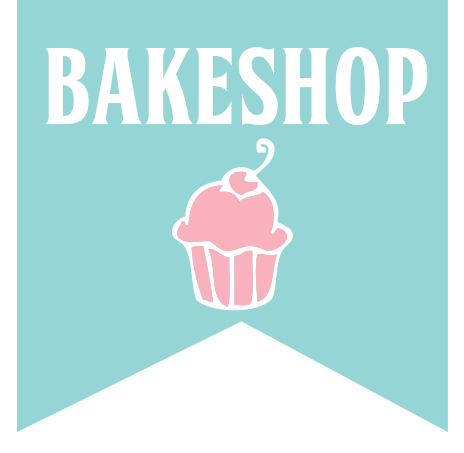 I am really excited to be back on the Moda Bake Shop sharing another project with you today. Moda Candy precuts (mini charms) are super cute and so easy to collect! 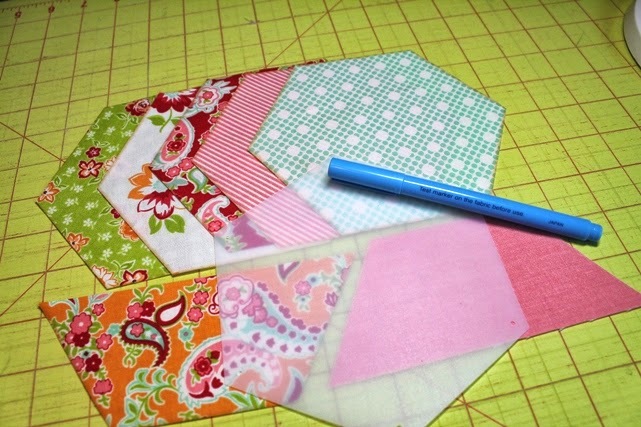 Here’s a fun & quick mini quilt project that could easily be enlarged to make a bigger version – just add more candy! 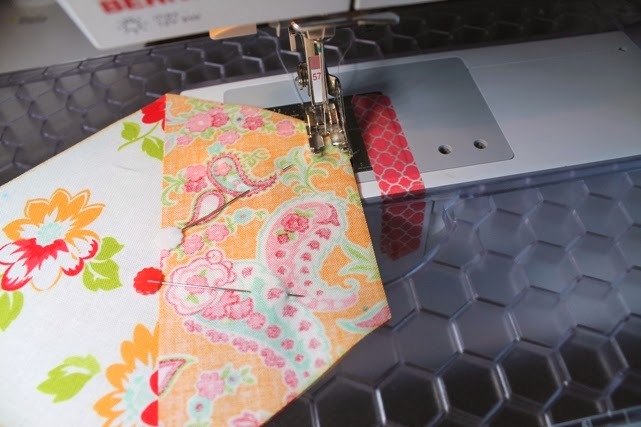 Use a 1/4″ seam throughout. 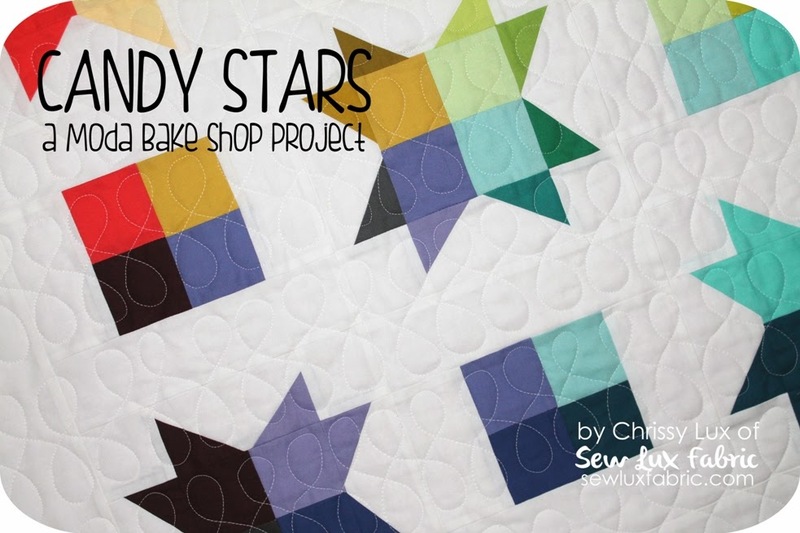 For this project, we’ll make two blocks – a variable star and a simple 4 patch. You’ll need four 4-patch blocks and five star blocks. Sort your candy squares into piles with five piles of 12 squares (corners & center) and four piles of four squares (middle of top & bottom row and left and right columns) as shown. 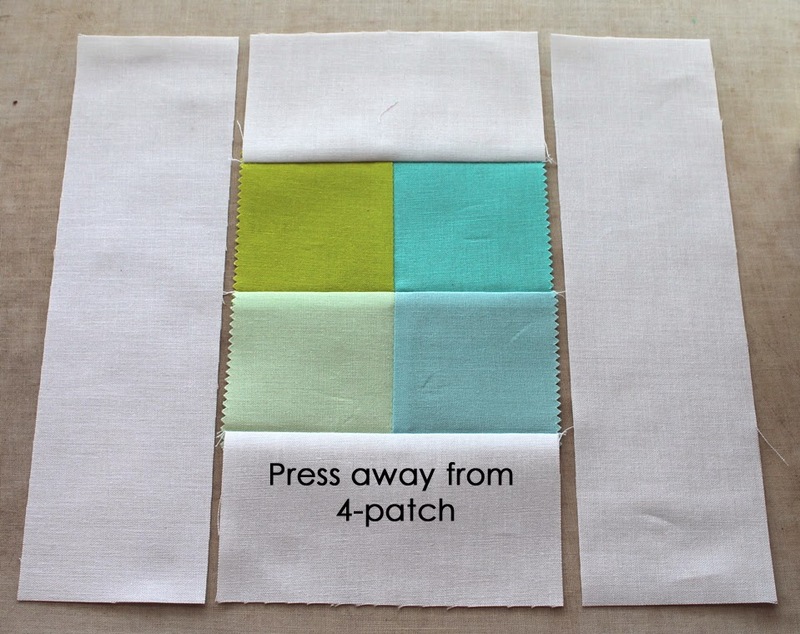 The 4-patch blocks are easy to whip together. 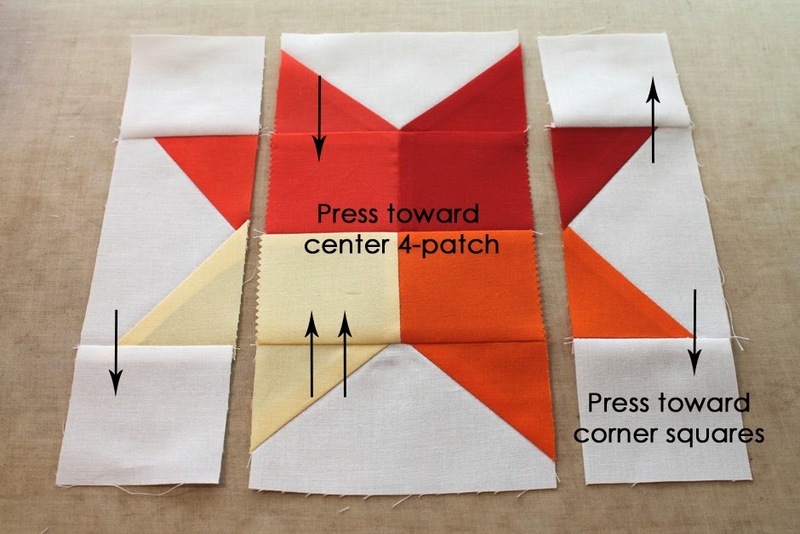 Sew two sets to two squares together. Press in opposite directions. Repeat this process for the four 4-patch units. Next, we’ll add borders to complete the units. 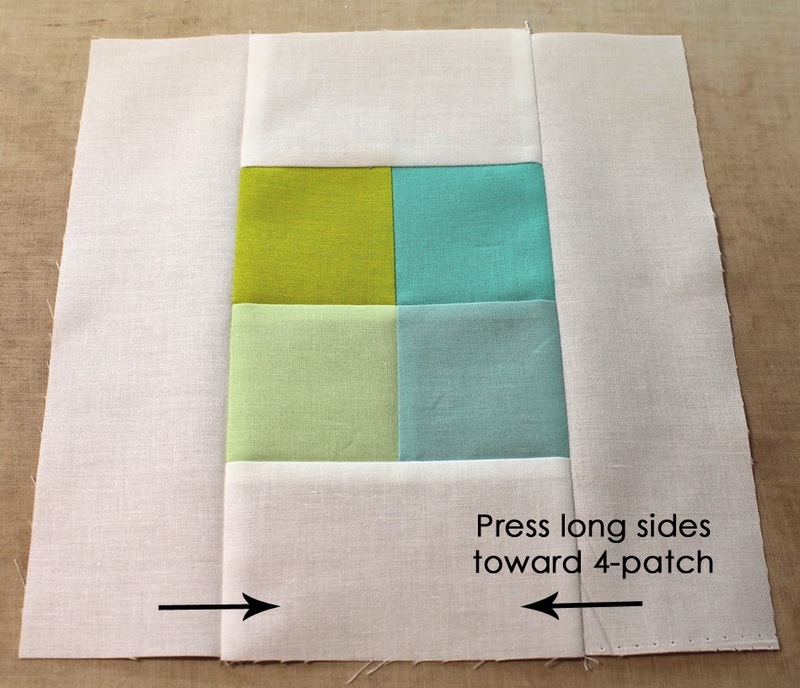 Sew a 2.5″ strip to the top and bottom of your 4-patch unit. Press toward the border/away from the 4-patch. Then add the 2.5″ x 8.5″ sides. Press toward the center. Repeat to complete all four 4-patch units. For these blocks, you will start by making a 4-patch for the center. Then we’ll make and add wonky geese on the sides to create the star. 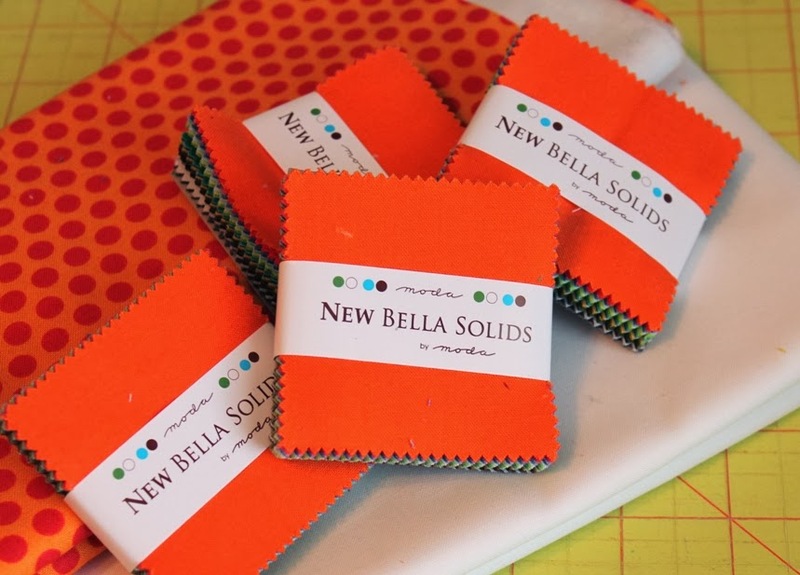 Place one candy square on top of one 2.5″ x 4.5″ rectangle. (If using prints, remember to place right sides together!) 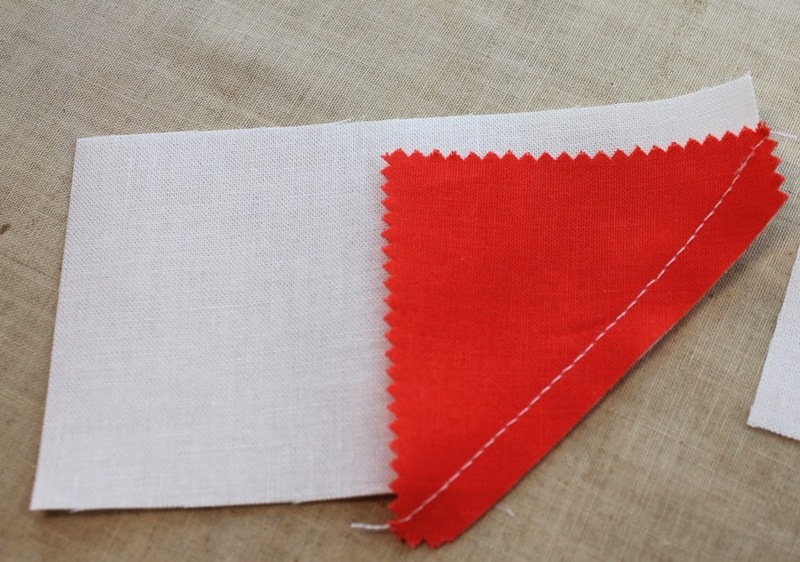 Sew on the diagonal, being sure that when you fold the square over, it will cover all of the background rectangle. 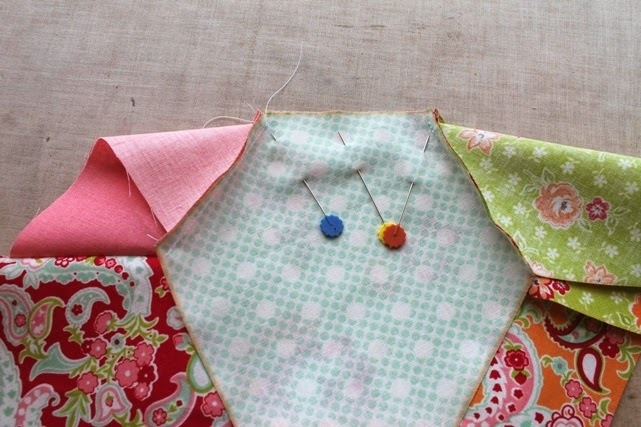 Trim away excess fabric and press toward the candy square. Next, add another candy square opposite of the first. 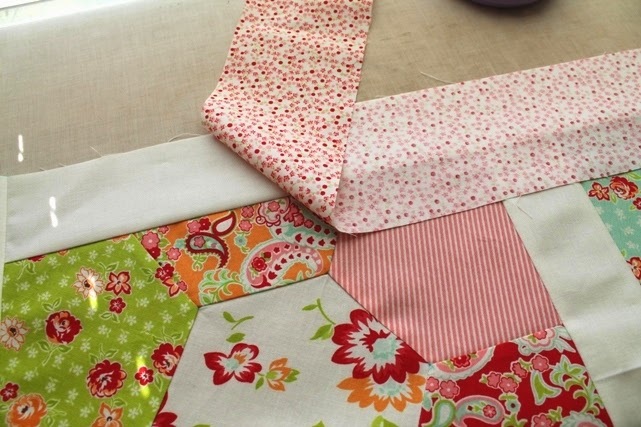 Sew along the diagonal, trim away excess and press towards the candy square fabric. 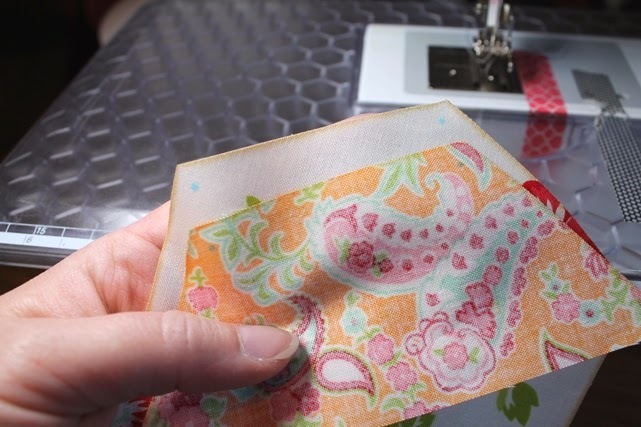 TIP: Since these are so small, I just finger press to create a crease down the diagonal as a sewing guide. If you prefer to mark with a pencil or disappearing ink, feel free. 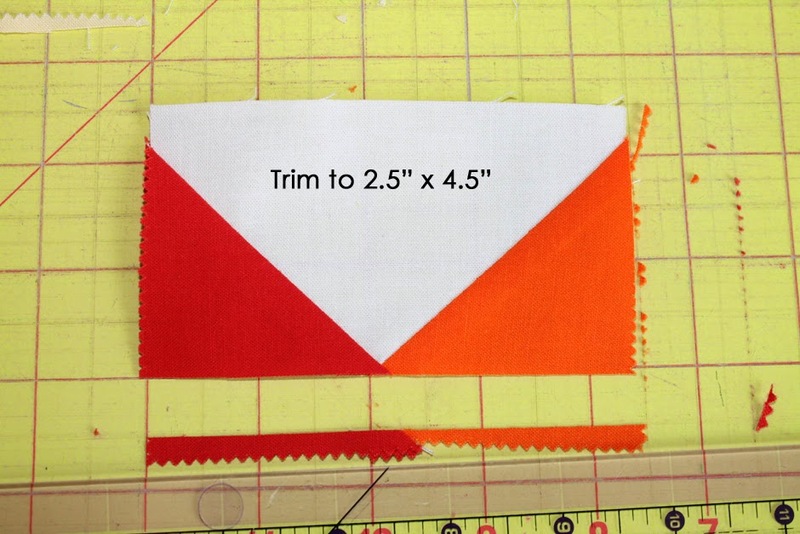 Trim your completed wonky geese unit to 2.5″ x 4.5″. 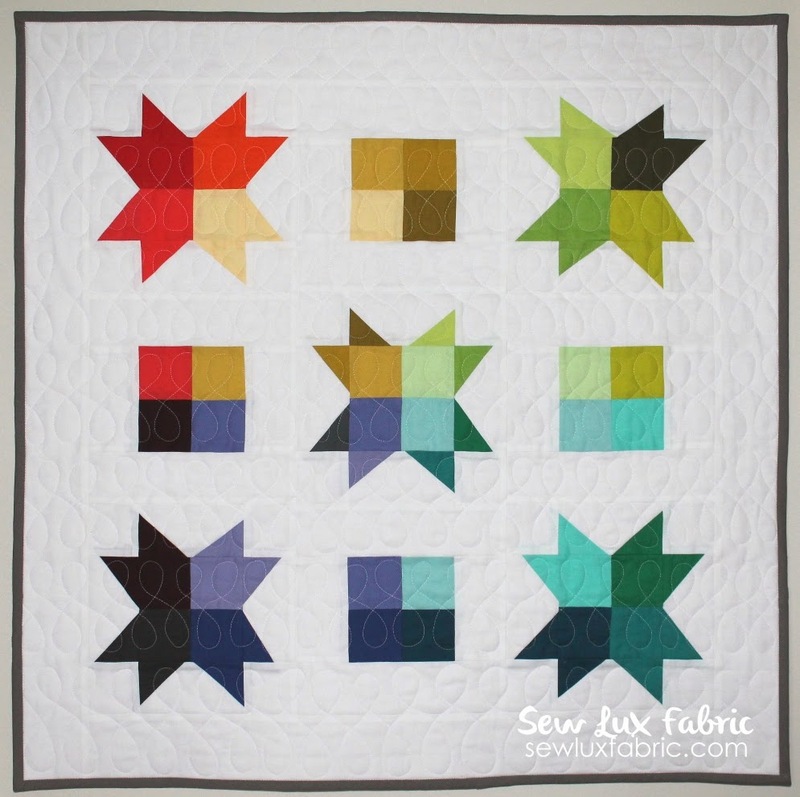 Assemble the star, by sewing two geese units to the top and bottom – press toward the center. 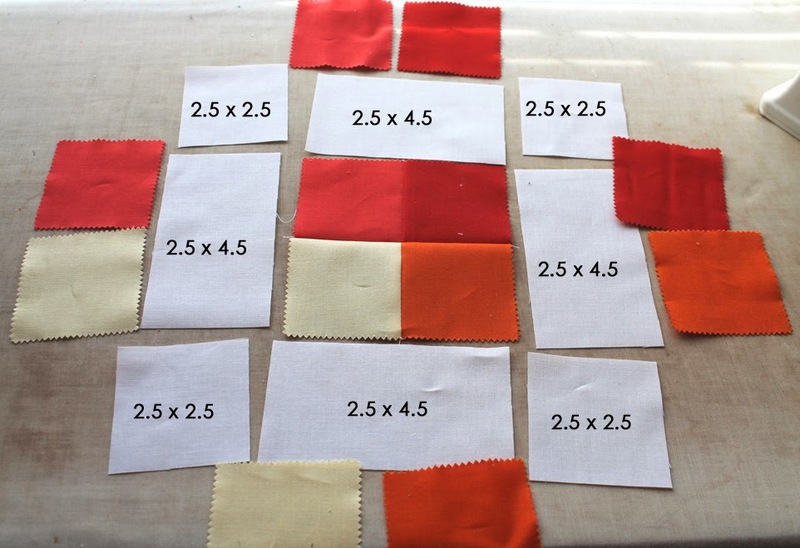 Then sew 2.5″ background squares to the sides of the remaining two geese units, pressing toward the background squares. Then sew the side units to the center, and press away from the center. 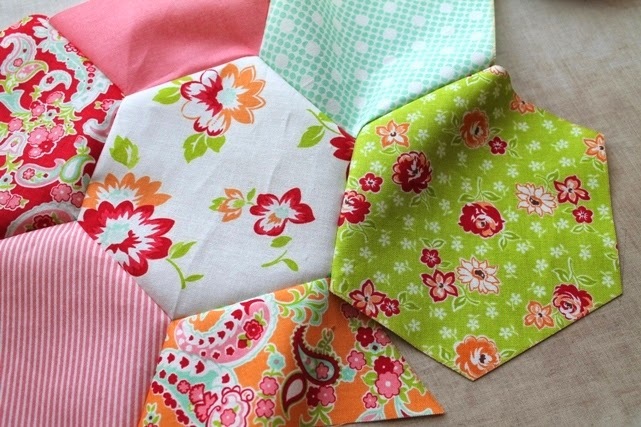 Now, its time to assemble your quilt top! 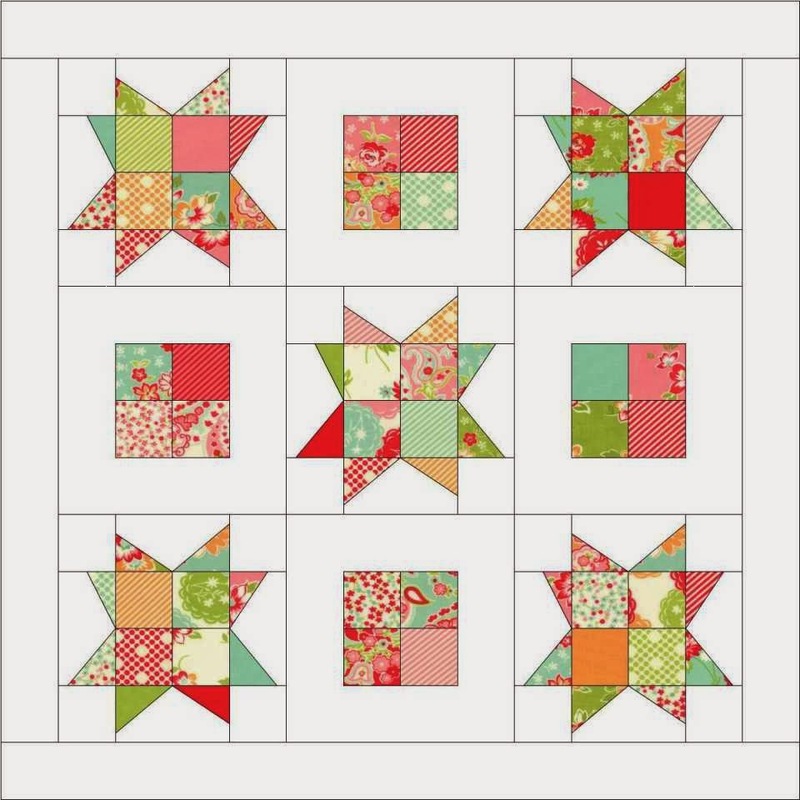 Start by making a large 9-patch with your 4-patch and variable star blocks. Then add border strips to the sides and then the top and bottom. 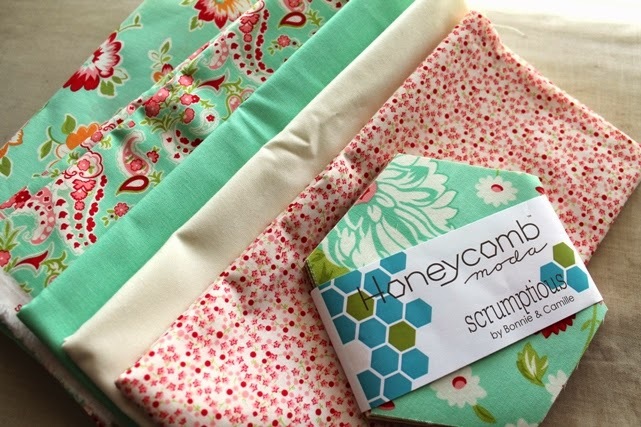 You can easily make this project with prints – here is a mock up of what it might look like in Scrumptious by Bonnie & Camille. 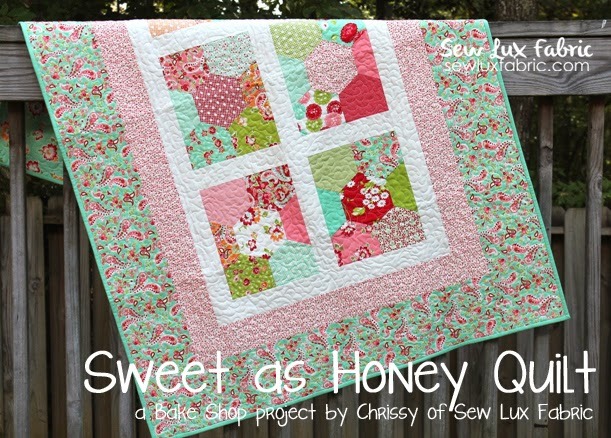 1 Sweet Mini Quilt approximately 30 in x 30 in. Hello everyone! 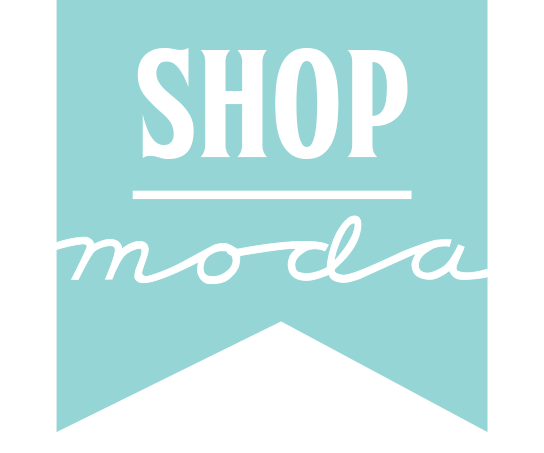 My name is Chrissy Lux and I am thrilled to be sharing a project here at the Moda Bake Shop! 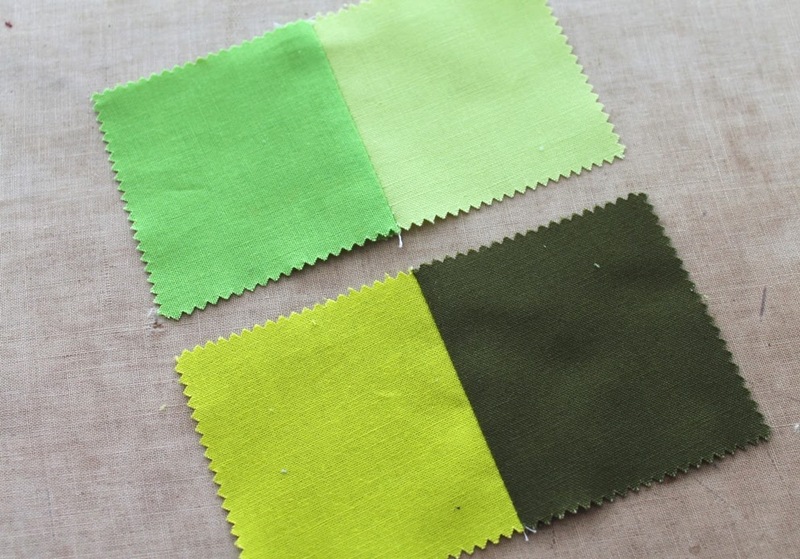 I co-own Sew Lux Fabric with my mom and share my adventures in sewing on our blog. 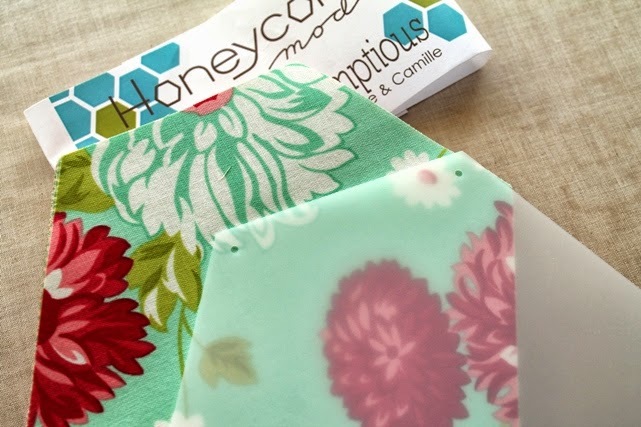 Hexagons are so cute and I was excited when Moda introduced their Honeycomb precuts. If you’re scared to piece them, don’t be! 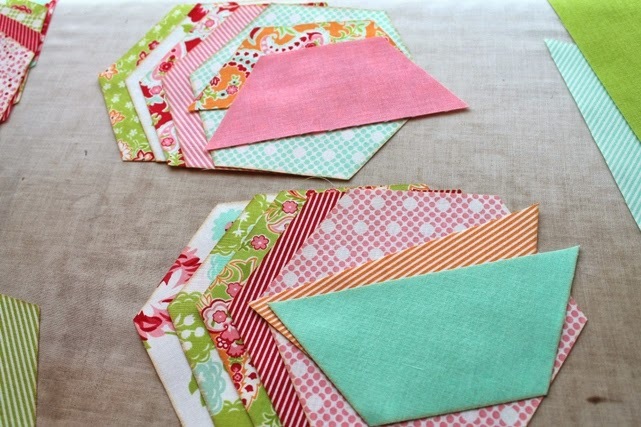 I am going to walk you through this quick and easy quilt. 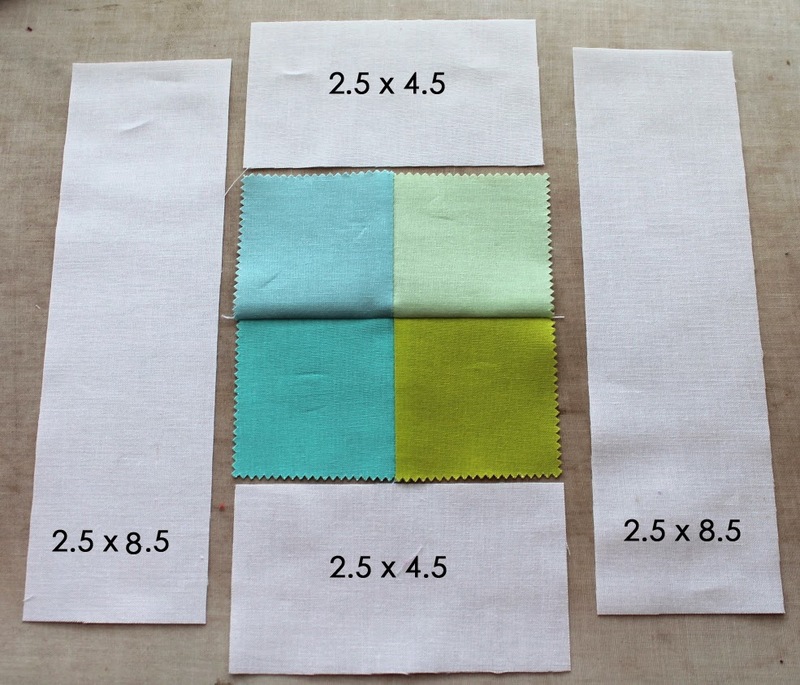 I’ve listed the ingredients below, but if you need a kit for this quilt you can order one here. 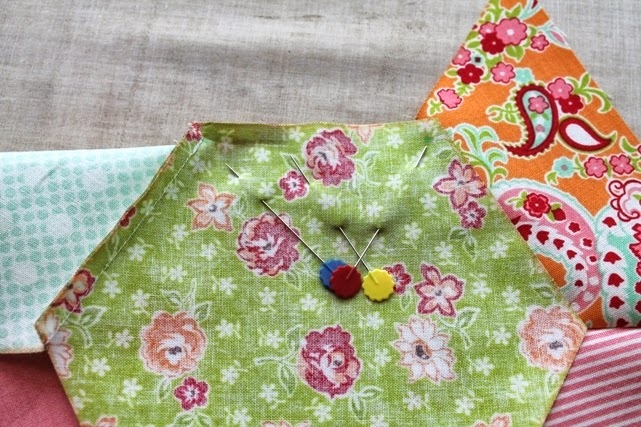 Let’s get sewing, shall we?! First, let’s cut all your sashing & borders so they’ll be ready. From the outer border print, cut five strips 6.5″ x WOF. From the inner border print, cut four strips 3.5″ x WOF. From the sashing solid, cut six strips 2.5″ x WOF. 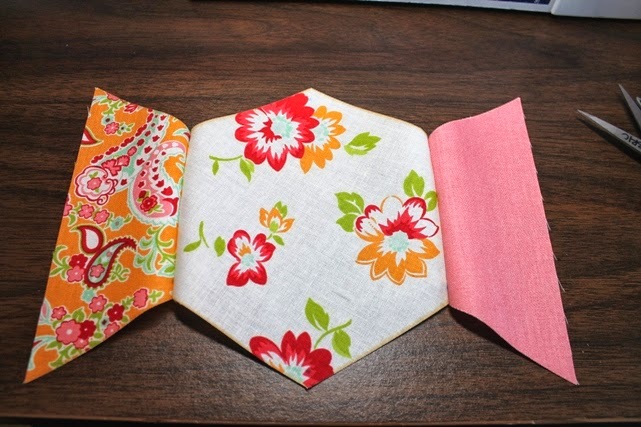 From the binding, cut six strips 2.5″ x WOF (not shown in photo below). Note: Try to disperse your colors among each stack. 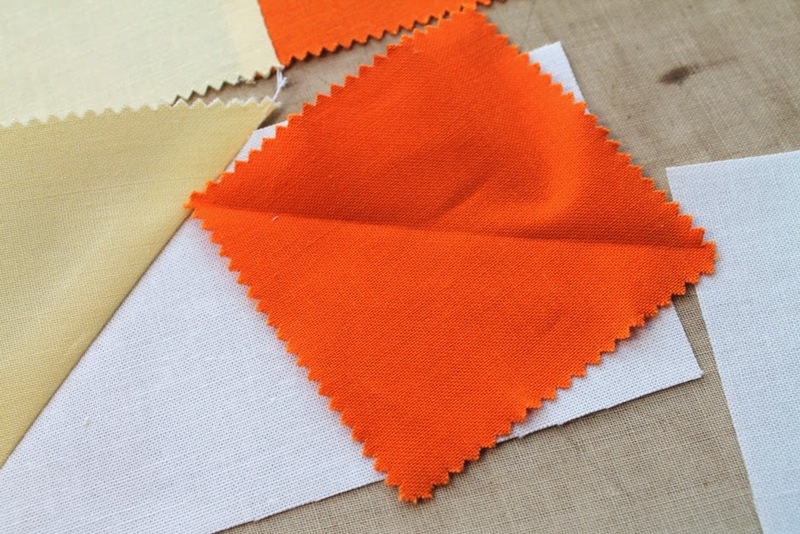 OR make them monochromatic – its up to you! 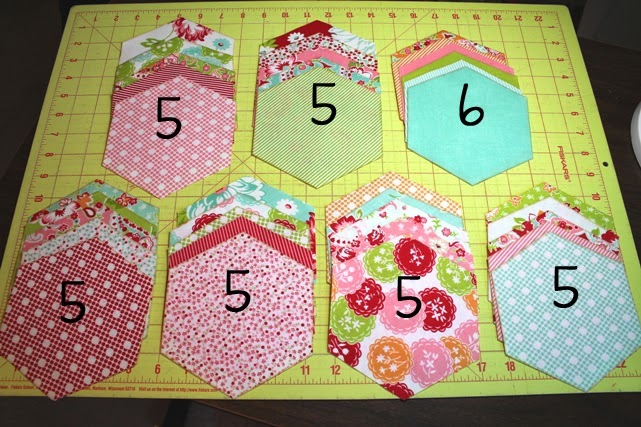 Use a ruler to cut the stack of six hexies in half. Add two half hexies to each of the six stacks of 5. Each Honeycomb comes with a plastic template with holes in the corners that make it super easy to mark your seam allowances! 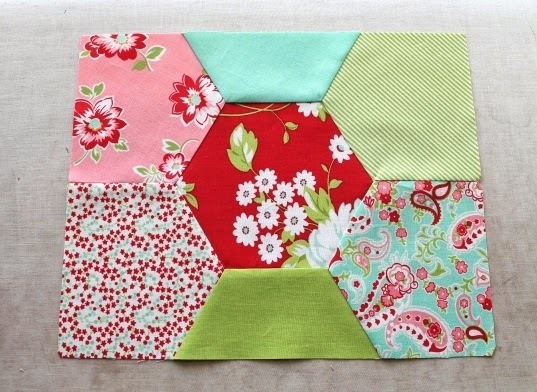 Grab a stack of five full hexies + two half hexies, the template and a marking pen. 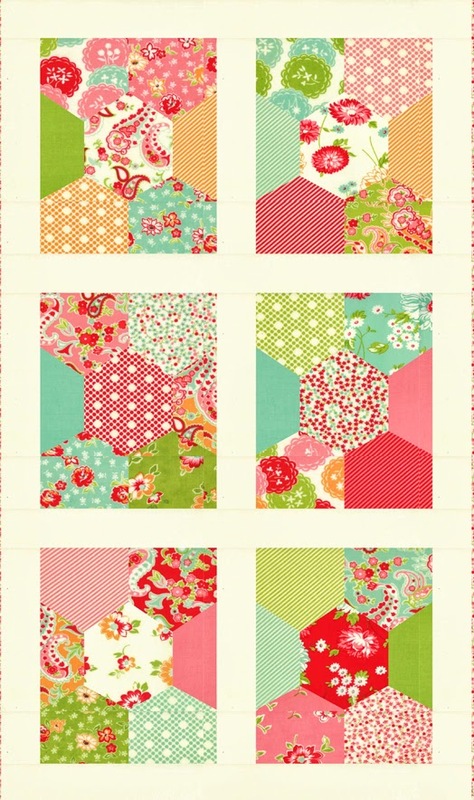 Use the template to mark dots on all the points the WRONG side of each hexie. 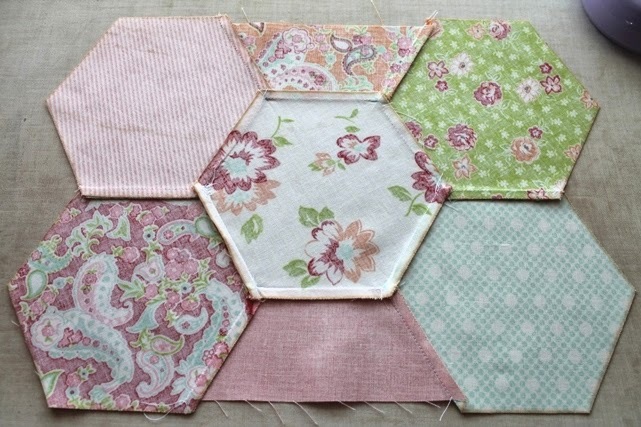 Next, take your center hexie and one of the half hexies and place them right sides together, lining up the dots. Pin in place and stitch from dot-to-dot using a 1/4 in seam. 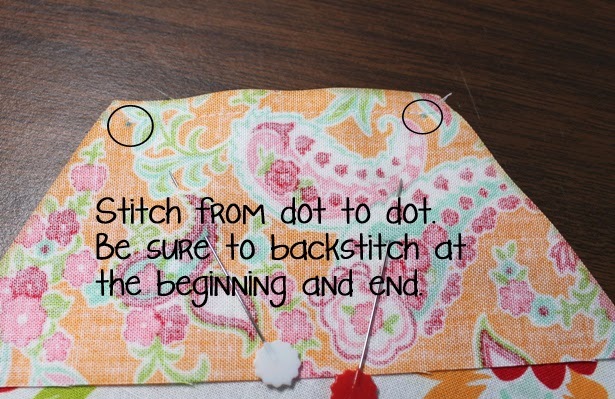 Be sure to back stitch at the beginning and end (the dots). Stitch the other half hexie to the opposite side of the center hexagon. 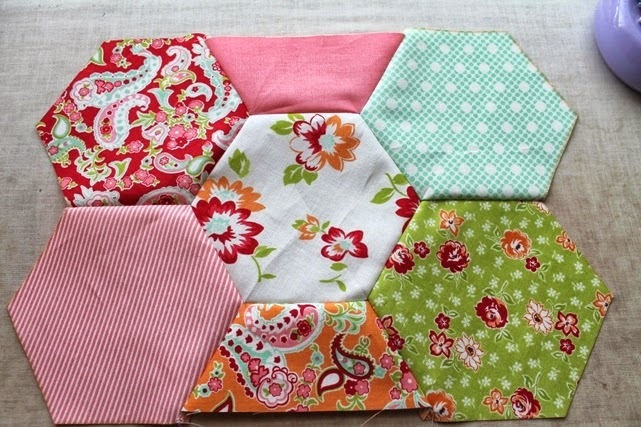 Sew two full hexies together. 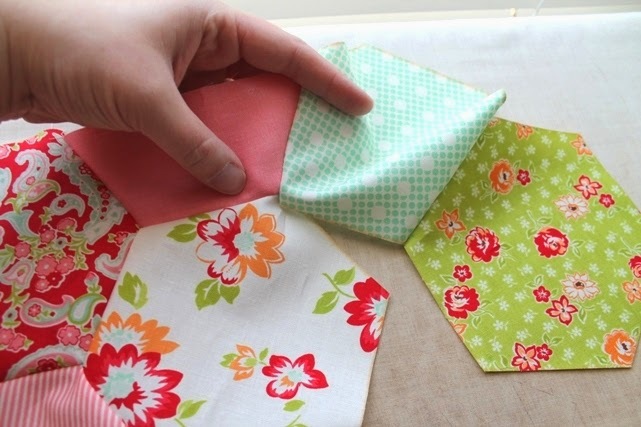 Line up the dots and stitch using a 1/4″ seam from one dot all the way to the outside edge of the hexies (ignore the second dot). Don’t forget to backstitch at the beginning dot! Make two pairs. BE SURE YOU ARE ATTACHING THE SIDE PAIR WITH THE OPEN DOT TOWARDS THE CENTER HEXIE. 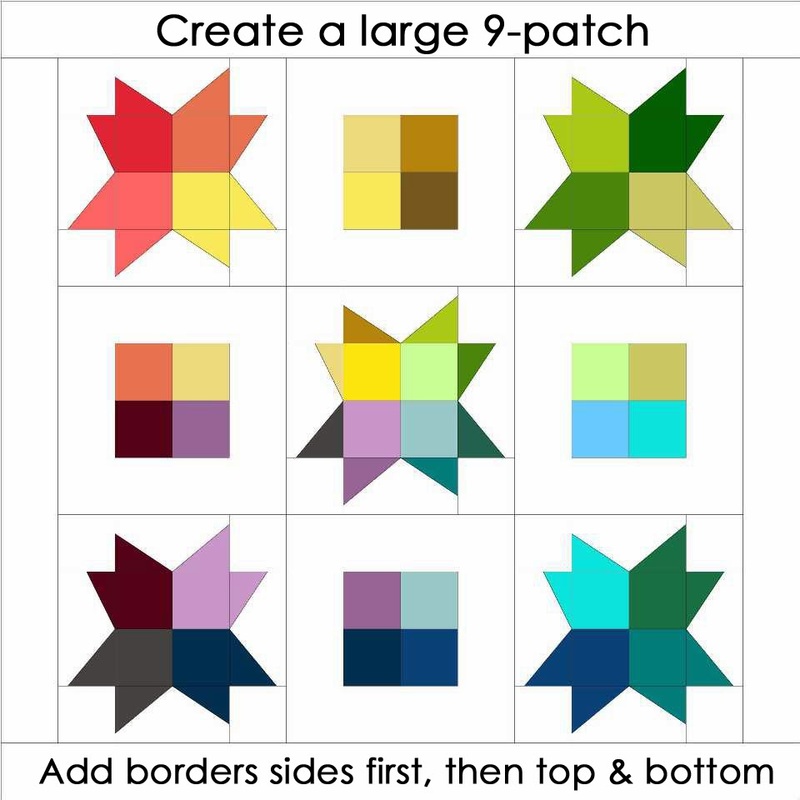 Pin the top side hexie to the center hexie. Match the dots and move the other pieces out of the way so they are like wings sticking out from the intersection of the dots. Stitch from dot-to-dot. Don’t forget to backstitch! Continue going around the center hexie. Pin and sew from dot-to-dot to attach the hexies. 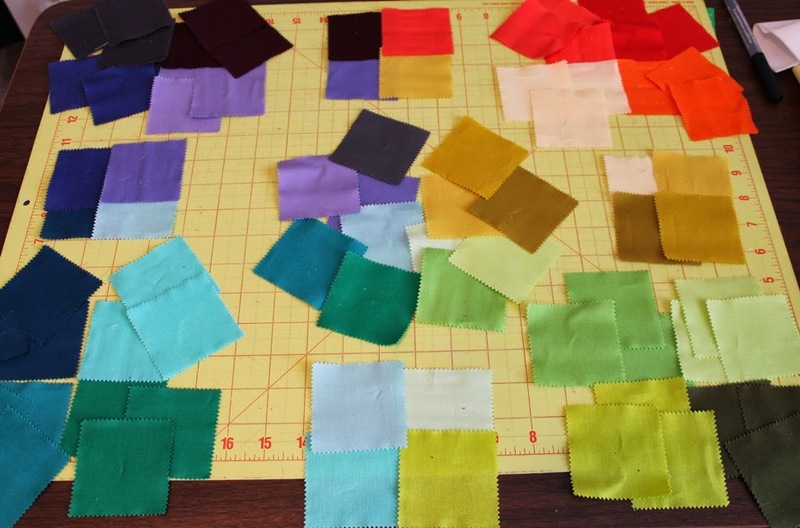 Make sure to move the other fabrics out of the way. 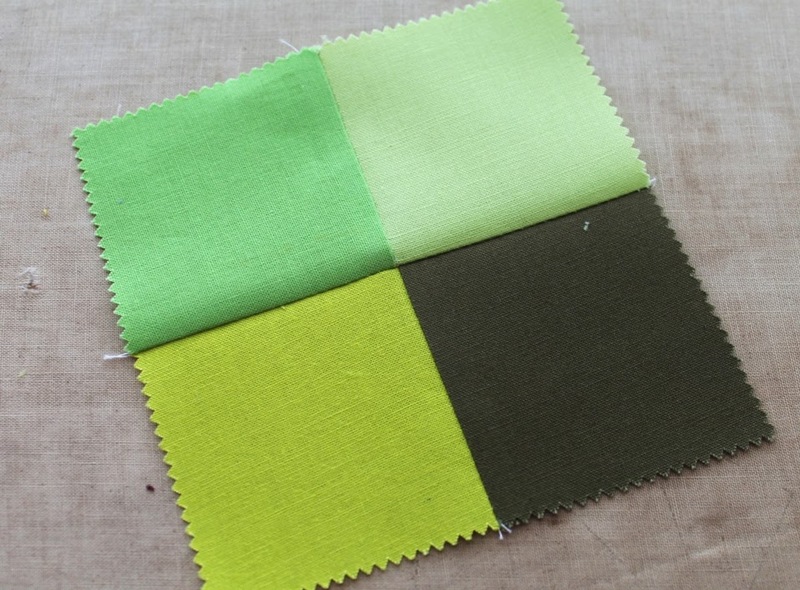 For the bottom, you’ll sew from the inside dot all the way to the outer edge of the fabrics. 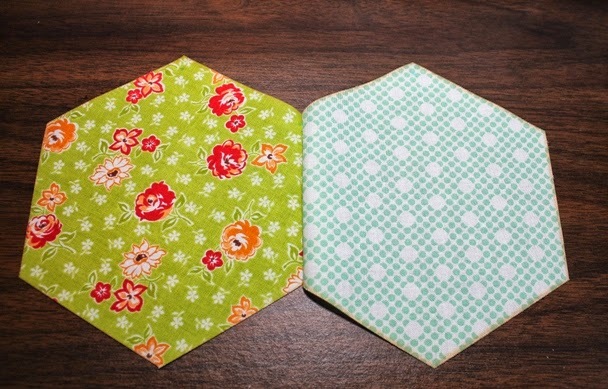 Repeat the process on the other side so you have a ring of hexies around the center hexie as shown below. 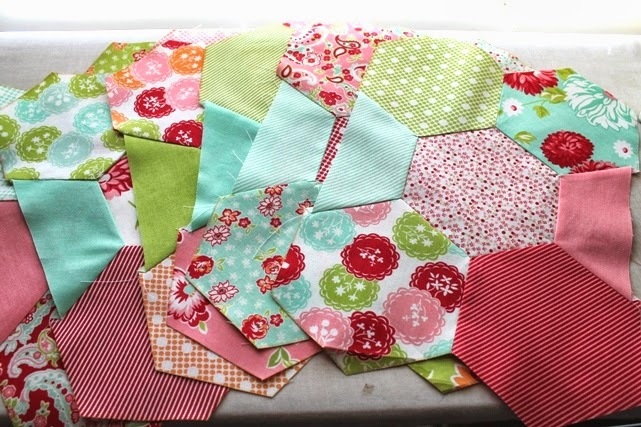 Make six blocks of pieced hexies. 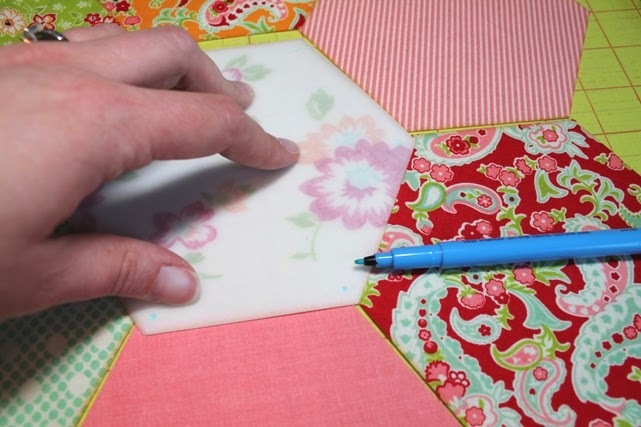 Press and use a ruler and rotary cutter to trim each hexie block to 9.25 in x 11.5 in. Let’s sash and add the borders! From one of the sashing strips, subcut into four 2.5″ x 9.25″ strips. Sash the blocks by adding the 9.25″ long strips between blocks to make two columns of 3 blocks. Then join the columns by adding the WOF strips between the columns and onto the right and left sides. Then use the remaining two strips to add sashing to the top and bottom. Add the inner border to the sides first (long sides) and then to the top and bottom (short sides). Finally, add the outer border. 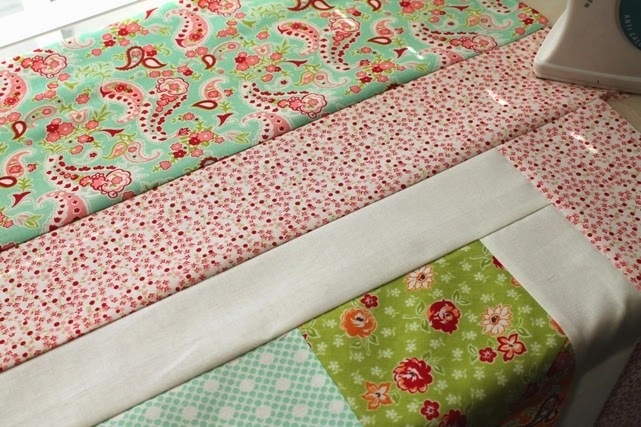 Cut ONE of the outer border strips in half (6.5″ x 22″) and sew one half strip to each of TWO WOF strips to make them longer. 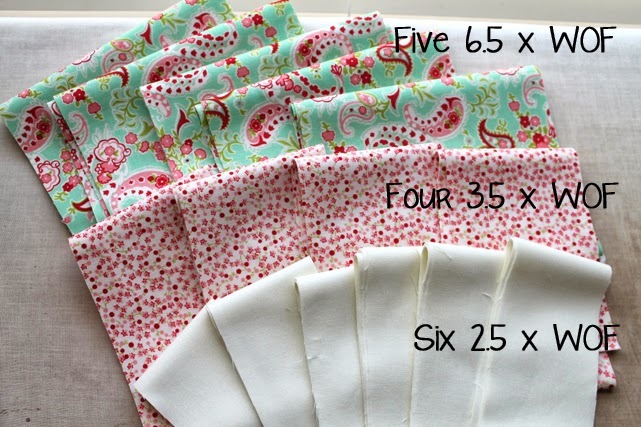 Sew two WOF strips to the top and bottom (short sides). 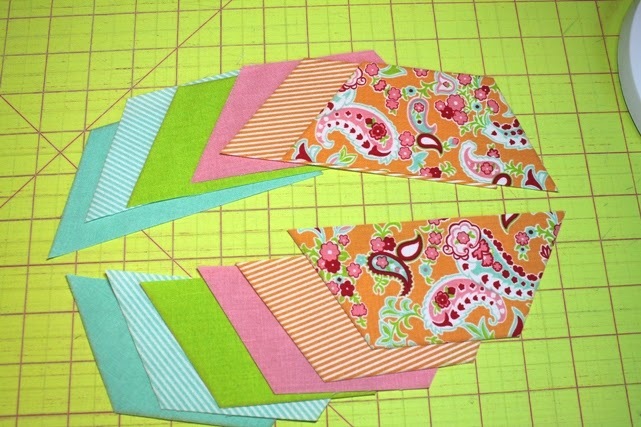 Then add the pieced strips to the right and left sides (long sides). 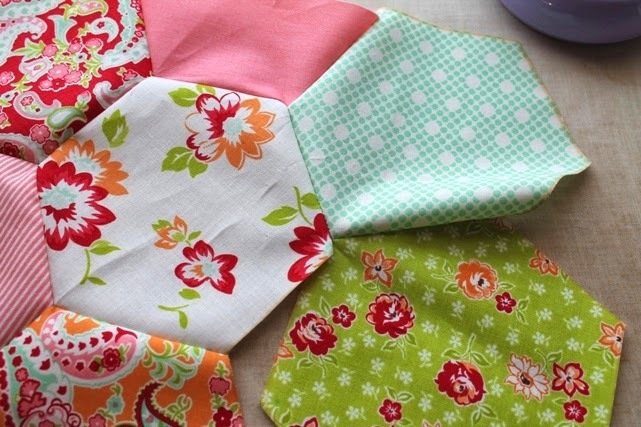 For the backing, cut your yardage into two 1.5 yard pieces. 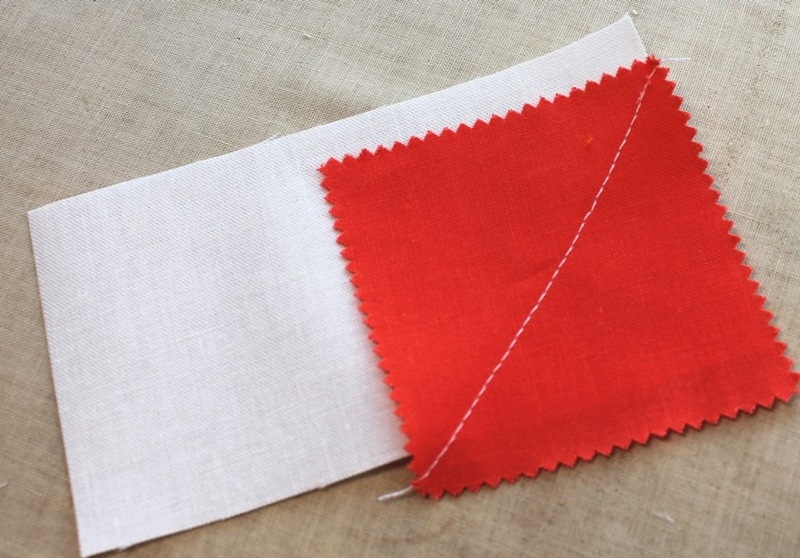 Sew along the selvage side – be sure to include a seam allowance and trim away the selvage. Layer and quilt as desired. Finish by adding binding. Need help binding? See the MBS tutorial here.